Consumer Reports discusses Payload designations such as half-ton, 3/4-ton, and 1-ton saying that they have little meaning except that a pickup truck is usually named according to its payload. There are some newer half-ton trucks that actually have payload ratings close to 1,000 lbs. However, most of these trucks are actually rated to carry 1500 lbs. give or take a few. However, the 3/4- and 1-ton pickups can carry much more weight than their rating would indicate. For example a 3/4-ton GMC has a GVWR (Gross Vehicle Weight Rating) of 8600 lbs., when subtracting the wet curb weight off 5300 libs it leaves a payload capacity of 3300 lbs. The brakes will have more impact on determining payload rating on some models. Most dual rear wheel 1-tons have a maximum payload of up to 5,000 lbs.because of the extra tires and better brakes. Payload can be misleading. For example, if you want to haul ¾ ton of mulch as measured by the loader capacity it is not the same as hauling ¾ ton of dense sand. 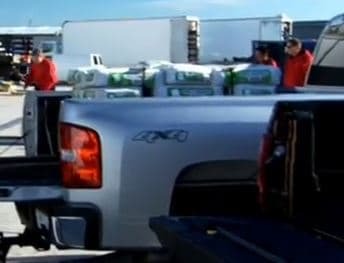 A good example is the 2011 Ford F-250 ¾ Ton pickup that has a payload of between 2,000 lbs. and 4,000 lbs. depending on how the load is configured in the bed. A F-350 1 Ton has a payload of up to 6,000 lbs. if the load is placed properly. A twist to the payload capacity is found in the F-450. It has a capacity of 4,929 lbs. The drivetrain and the configuration reduce the payload over the F-350 model.Too many people do not understand that payload is affected by many factors such as the density of the weight being carried, the placement in the cargo area, whether the load is wet or dry, and whether the tires are in good condition as well as the brakes. As we can see, a vehicle manufacturer’s rating is not always accurate, and in fact, seldom is to the extent that more weight can be carried than the payload would indicate. The payload rating is not as important as understanding the maximum payload capacity and the nature of the payload. Regardless of how much the payload rating is, if the tires and brakes are not good enough to handle the payload, then the high potential rating is worthless. Every dealer publishes a payload guide that will help determine the payload capacity depending on the payload. Beyond this, the condition of the vehicle powertrain, brakes and tires will be payload determinants.